Extreme conditions and their effects on matter and materials are currently fashionable topics in modem science. Perhaps the fascination derives from the unimaginable dimensions that grab our attention and push the boundaries of our imagination. Imagine the pressures in extremely dense neutron stars where electrons and protons are fused together and atoms collapse to the density of an atomic nucleus; imagine temperatures of thousands of degrees Kelvin at the solar surface, or multimegabar and terapascal pressures deep within the interior of our planets. But even a simple droplet of water represents an extreme environment when it comes into contact with an otherwise stable crystal of rock salt, causing the crystal to dissolve as external conditions are drastically changed. We have an inherent desire to understand these diverse kinds of phenomena in nature, the mechanisms of the material changes involved, as well as the extreme conditions which are becoming increasingly demanded to achieve the extraordinary performance of new engineering materials. This rapidly evolving area of science is necessarily interdisciplinary, as it combines fundamental physics, chemistry and biology with geoplanetary and materials science, in addition to increasingly becoming one of the keys to engineering and technology aimed at process optimisation. Current experimental methods permit materials to be studied at pressures of several megabars, temperatures of tens of thousands of degrees Kelvin, and to achieve magnetic fields of several thousand teslas. Moreover, the rapid surge in computer technology has, in turn, permitted the solution of many previously intractable problems, and now even allows the behaviour of matter to be predicted far beyond the range of conditions currently accessible to experimentation. Previously unknown phenomena such as the formation of new phases, new forms of electronic and magnetic order, melting, atomic and electronic excitation, ionisation or the formation of a plasma state might result from exposing matter to extreme conditions well beyond those which were characteristic of the equilibria at the time of formation. 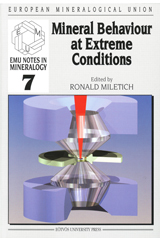 With this volume of EMU Notes in Mineralogy we have endeavoured to provide up-to-date reviews of our understanding of the behaviour of minerals and geomaterials at exterior conditions that are sufficiently extreme to induce changes. In total 18 chapters reflect the diversity of this theme, but also demonstrate how strongly interdisciplinary this domain of modem mineralogy has become, bringing together physicists, chemists and geologists as well as experimentalists and computer scientists. The present volume contains the contributions of the lectures presented at the 7th EMU School, held at the University of Heidelberg from June 19 to June 25, 2005. More than 60 participants including young scientists from 12 countries made this School a scientific success, with the added benefit of a week of brilliant sunshine in romantic Heidelberg. This level of success was only possible through the tireless support and commitment of many helpful hands. It is my hope that this volume might help to further our recognition and understanding of the behaviour and transformations of geomaterials under extreme conditions. But we also need to remind ourselves that we still decide rather arbitrarily where to set boundary limits and how to define "extreme". Perhaps this book will provide the reader with some idea of where these limits are today, and where they might be going in future. i-xiv + 488 pages. ISBN 963 463 8379.